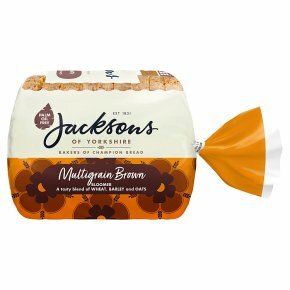 Jackson’s Yorkshire’s Champion is our way of honouring our roots with bread that’s bursting with honest Yorkshire goodness. Deliciously moreish, tasty brown sliced bloomer bread, a multigrain loaf with flakes of barley and malted wheat, jumbo oats and malted kibbled wheat. Suitable for vegetarians. Suitable for vegetarians. Our bread is lovingly baked in Yorkshire with flour that's milled in Yorkshire, making this loaf bursting with Yorkshire goodness! Tasty brown sliced bloomer bread, a multigrain loaf with flakes of barley and malted wheat, jumbo oats and malted kibbled wheat.